October 11, 2017 | Submitted by: CityScapes Inc. When placed in a corporate environment, natural foliage and flowers positively enhance perceptions of your business. Exterior facades, interior walls, and walkways which are adorned with greenery present a more relaxed, welcoming and professional ambiance to visiting prospects and customers. People are impressed and automatically assume your company deeply cares about its brand and reputation. When a company cares about its reputation, customers predict they’ll be treated well and receive the best services and products. Here are 7 more ways adding more greenery can make a positive impact on your business environment. Indoor plants improve the air quality of interior spaces. Studies conducted at the Washington State University [source] discovered the amount of dust present in a room was reduced by as much as 20% with plants present. In the same studies they also found the levels of relative humidity rose as more plants were added, thereby improving human health and comfort. When humidity is too low, it’s easier for employees and visitors to catch colds. Outside, plants absorb and filter out dirt and pollutants, helping to provide a cleaner local air quality. Plants reduce certain sounds in an exterior or interior environment. Outside they can muffle ambient sound including traffic, crowd, animal, and water noises. 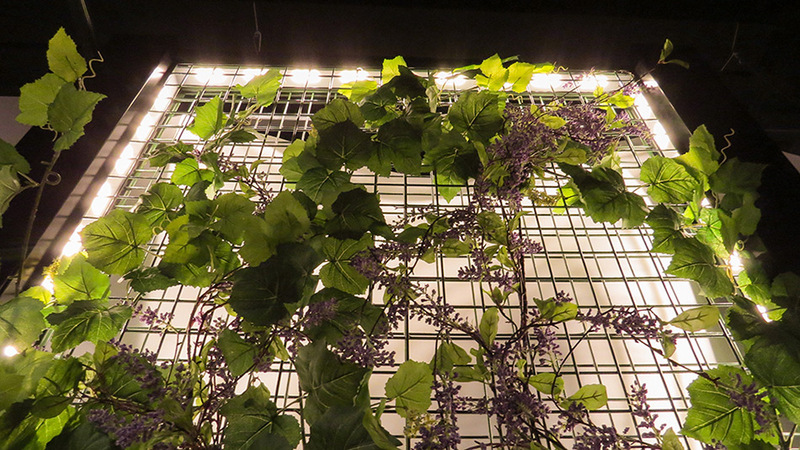 Plant-covered exterior walls absorb sound and as a result reduce annoying sound reflection and echo effects. Planters placed in particular locations can also reduce crowd noise in public and communal spaces. The presence of plants increases wellbeing among employees and visiting customers. We all know how refreshed and buoyant we can feel after a walk or vacation in the natural world. Experiments have found that even just a short amount of time among plants and trees can boost contentment levels [source]. Increasing the amount of greenery throughout your interior and exterior company premises can have a similar effect. Studies in Europe found employees were 15% more productive in offices “enriched by plants” than they were in offices without any plants [source]. The addition of greenery boosted productivity. When every member of staff could see a plant from their workspace, their work performance improved. Many companies now invest in creating whole walls of greenery to further cultivate productivity and employee engagement. Many business premises have unsightly architectural features and equipment they would rather hide. Trellising panels can provide strong structures on which plants can grow and eventually create an attractive and protective wall of greenery. This both improves the aesthetic look of a building and also provides a kind of shield from the harmful effects of weather including acid rain, UV light, and wind. Exterior wall greenery can also reduce energy costs. In the hot summer months, the plant-covered trellising prevents the full heat of the sun’s rays from reaching the building’s walls. In the cold winter months, a blanket of evergreen foliage traps a layer of air against the façade which reduces heat loss from within the building. Attracting and retaining top talent is an important consideration for many companies and part of employee satisfaction is the environment in which they work. Numerous studies have shown the positive effect extra greenery in and around the workplace has on employee contentment and retention levels. A happier employee is more creative, productive, and loyal. Bringing the natural world into the corporate space brings a company many benefits, from improved air quality and energy conservation to increased employee productivity and positive brand perceptions. Adding more greenery to a business environment really does seem to be a sensible decision to make. Welcome to the new CityScapesInc.com! Commercial Ground Screening: Why Choose CityScapes?